Newborns have very delicate skin, especially those who have been delivered past their due date. They are also prone to eczema, which makes their skin dry and itchy. In order to protect your child’s skin and minimize irritation, it’s important to moisturize his skin a couple of times a day, but not with just any lotion, but only the best baby lotion available. We only want the right stuff for you children, so for our lineup of the five best baby lotions, we only considered what we believe and know to contain none of the harmful chemicals mentioned earlier. Products by Baby Botanicals are produced by an organic farm in New York, so you can be sure that their baby lotion and other baby products are safe. Their Oatmilk Calendula Moisturizing Baby Lotion notably features natural botanicals that are designed to be extra sensitive and nourishing to your baby’s skin. It provides protection for dry skin and comforts itchy and chafed skin caused by Eczema. Its Shea Butter content, on the other hand, helps moisturize the skin and relieve cradle cap. This lotion has a mild scent and smells delicious but not sickening. 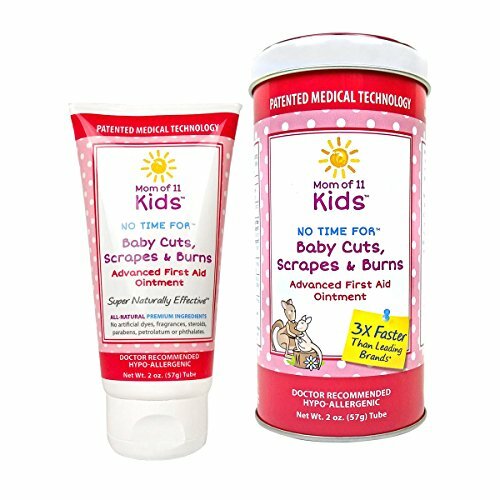 It works well with sensitive skin and is ideal if your child has eczema. The texture is not too greasy and absorbs quickly. The pump has a tendency to break easily. Earth Mama has been in the business of making organic products for over a decade now. This baby lotion is particularly blended with herbal ingredients that help moisturize and protect delicate skin. It contains Rooibos and Calendula and is ideal for your baby’s dry and itchy bottoms. Among its main ingredients are Organic Aloe, Shea Butter, Olive Oil, and Sweet Orange. It’s the first personal care product made in the US that has been certified to the NSF/ANSI 305 Standard for Personal Care Products Containing Organic Ingredients, so you can be sure that it’s toxin-free and truly safe for your baby. This lotion is foam, so there’s no need to worry about residue. It spreads very easily on your baby’s skin. It makes a lot of difference for skin with psoriasis and similar skin problems. The citrusy smell may be too strong and irritating for some. This is not a very popular brand yet, but we included it on this list because it meets our criteria for safe and effective baby lotion. It’s dermatologist tested and is hypoallergenic. It has a triple action formula that calms, softens, and repairs the skin. It has a non-greasy formulation and is perfect for sensitive skin. Most importantly, it contains all-natural oils and butter including Shea Butter, Jojoba Oil, and Chamomile Oil. If you’re looking for a baby lotion that’s specially formulated for eczema and dry skin, this should be a great option. This lotion is thick, and a little of it goes a long way. It’s very easy to apply on the skin. You will indeed have “no time for eczema” with this lotion. Since it’s not a household name yet, it’s not available in a lot of online sources. BareBaby Organics was started by a stay-at-home mom and her chemist husband. Their desire was to create a lotion that’s natural, organic, and safe. 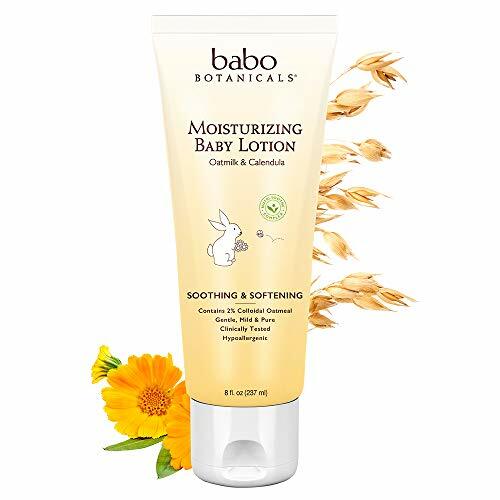 With their own baby in mind, they came up with BareBaby Organics Moisturizing Lotion, which according to them is, “The safest lotion you can buy. Period.” Every ingredient in this lotion is rated 1 on the Skin Deep Database, which means it’s non-toxic as can be. This also means this lotion does not contain dyes, fragrances, parabens, phthalates, and sulfates. On the other hand, it features Aloe Vera, Calendula, Chamomile, and Shea Butter as its main ingredients. It doesn’t leave the skin oily and goes on smooth during application. It takes only a small amount of this lotion to cover a large area. It works well for both babies and adults. The price per ounce for this product is higher than that of its counterparts. You’re probably familiar with this product because it has been featured several times on live TV, particularly on NBC, FOX, CBS, and ABC. The product has been developed by doctors with each formula being made from plants and natural fragrances. This lotion contains renewable ingredients that break down safely in the environment. Its creators pride themselves in using formulations that are free from any harmful chemicals and animal-based ingredients. Enriched with Vitamins E and B5, as well as Shea Butter, this lotion is designed to moisturize the skin deeply without leaving residues. It doesn’t leave any sticky or slimy feeling at all. You can tell right away that its formula is top-notch because it moisturizes the skin very well. The fragrance is not the typical baby smell that most baby products offer, but is not overpowering at all. It’s very thick and creamy and may be difficult to dispense sometimes. All five of these baby lotions are actually safe and effective for your baby, but our top pick is the BareBaby Organics Moisturizing Lotion. Perhaps what gave it an advantage over the other four is the amount of research it has gone through. Since the creators are both parents who desire nothing but the best for their own children, it’s safe to say that they had their own kids in mind while creating the product, making sure it’s not just effective but is also safe to use. Moreover, it’s great not only for your baby’s skin but your skin as well. It’s also interesting to know that this lotion is 100% gluten-free and is free of other common allergens present in most commercial baby products. Most importantly, each ingredient in this lotion has a score of 1 on the Skin Deep Database and has met Whole Food’s rigorous standards. That means you can use this product for your little one with the assurance that it’s not going to do its job without harming your child. We don’t have a video showing our top pick in action, but here’s one that will teach you how to apply lotion on a newborn baby. Your baby’s skin needs proper care because unlike your skin, his skin is extra-sensitive. Yes, his skin may be very resilient, but it’s also thinner and is more prone to irritation. During his first few months, the protective barrier of his skin is still developing and adapting to its new environment. For this reason, it’s still very vulnerable to rashes, chapping, and chafing. It also tends to dry easily. And while your newborn may be cute, his complexion won’t all be peaches-and-cream in appearance. In fact, it won’t be that pretty to look at initially. Here are a few things you can expect about your baby’s skin during the first few months of his life. It’s reddish-purple the first few days. Regardless of your ethnicity, your newborn’s complexion will have this color within his first week. His circulation system is still in its beginning stages, so his actual complexion won’t be appearing anytime soon. In fact, for some children, it takes up to six months for their permanent skin tone to develop. How Can A Baby Lotion Help? WebMD recommends that you don’t use lotion on your newborn’s skin unless it’s especially dry. There is truth in this since your child’s skin is actually moist beneath the topmost layer and is protected by a cheese-white coating called the vernix. However, some doctors suggest that you can already start applying baby lotion on his skin about after a month of his birth when his skin has flaked off on its own. Many parents have their own strategies for keeping their children’s skin dry, often without having to use packaged creams or lotions. Some of these strategies include applying organic Shea Butter, lubing up with Olive Oil, and bathing less often. Before you go out and pick just any brand of baby lotion, you need to understand that there are five things that might be wrong with the commercial products you often see. Most brands of lotion that are supposed to be intended for little children contain harmful chemicals. Phthalates: These chemicals are being phased out of children’s products, but it’s still better to check if what you buy include them as they have been linked to autism, obesity, early puberty, and congenital disabilities. Parabens: These are known to be endocrine disruptors. Ethanol: A potentially dangerous chemical and is considered carcinogenic. Phenoxyethanol: Commonly used as a preservative in cosmetics and has been linked to life-threatening allergic reactions. Fragrance: Sometimes referred to as “parfum,” and usually contains Phthalates. What about you, our dear readers? What brand of lotion do you use for your little one? Let us know in the comments section! And please don’t forget to share this article if you found it valuable! Thank you!